Here’s what’s up in the world of TV for Monday, May 9. All times are Eastern. Castle (ABC, 10 p.m.): “When an axe-wielding, escaped psychiatric inmate drops dead in Castle’s P.I. office, Castle and Beckett’s investigation leads Castle to suspect the victim’s death could be the work of the Antichrist.” Keep in mind, if a P.I.’s go-to theory is that a perp is the Antichrist, he probably—no, definitely—shouldn’t be a P.I. Right? Right. And in case you’re thinking there’s no possible way that Castle could really believe the Antichrist is involved, please look at this other version of the synopsis: “A psychiatric inmate escapes and drops dead in Castle’s PI office, and the investigation that follows has Castle surmising the Antichrist could be involved.” Castle is the character who’s staying on the show. 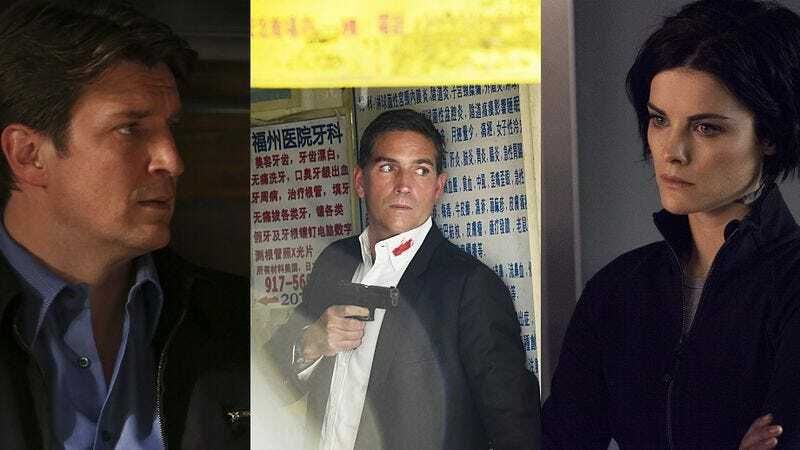 Person Of Interest (CBS, 10 p.m.): Yes, yes, we know that Person Of Interest is so much more than your standard procedural and has been for the majority of its existence. But we’re doing a thing here, and Person Of Interest deserves all the attention it ever gets. Plus, this is the time slot premiere of the series’ final season, so we kind of have to bring attention to it anyway. This week in fun procedural antics: “The Machine experiences a glitch during rebooting, supplying Reese and Fusco with the numbers of dozens of people not actually involved in crimes, while also locking Finch and Root out after identifying them as threats based on past violent behavior.” Whoops. That definitely is a “SNAFU,” POI. Alexa Planje once had a machine identify her as a threat based on her past violent behavior. She doesn’t like to talk about it. Blindspot (NBC, 10 p.m.): “The FBI is locked down when criminal hackers infiltrate the building, trapping the team inside SIOC. As they fight their way out, the close quarters force Mayfair, Zapata, Reade, and Sarah to confront personal conflicts.” You guys! It’s Blindspot’s Die Hard episode! But that probably also means Agent McStubble… er, Weller, will be the John McClane of this piece, and no one really needs that. Nor does Sarah need to be inside SIOC? Why is she there? Don’t they have security? Not the point—we know. So are you a Castle cat, a Person Of Interest playa, or a Blindspot bro? And if you’re the first one, why are you that way? Damien (A&E, 10 p.m.): Tonight, Damien ends its first season with “Ave Satani.” That’s no #TeamLucifer, but we suppose we’ll take it. According to the episode synopsis, “Damien makes the ultimate sacrifice as Rutledge and Lyons target Damien’s circle.” The “ultimate sacrifice” is himself, right? Crazy Ex-Girlfriend (iTunes): Keeping in line with our procedural theme… We can do this, we can do this… Rebecca Bunch is a lawyer—so Crazy Ex-Girlfriend sounds like a procedural to us. Wow. This show really does transcend genres. Anyway, you can download it all right now for free. Congratulations!